This chapter draws on the material presented in the previous chapters to provide a summary account of the election focussing on the political, economic and international contexts in which it took place; on the parties’ strategies in the run-up to the vote; on the campaign, and on the election outcome. 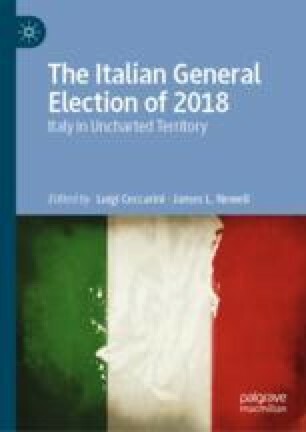 It then asks about the extent to which the election and its outcome represented a watershed in Italian politics, addressing the question from the perspectives of parties, voters, the government and the regime. It argues that in recent years, what have, at the time they happened, appeared to be fundamental changes, have often failed to last and that, perhaps, what best captures the novelty of 2018, then, is the idea of a new era of fluidity and uncertainty. If anything, then, was certain after the 2018 election it was that the future of Italian politics looked at one and the same time to be both very interesting and at least somewhat worrying. Istat. 2018. La povertà in Italia. Anno 2017. https://www.istat.it/it/files//2018/06/La-povert%C3%A0-in-Italia-2017.pdf. Jacobs, Matthew. 2016. Michael Moore: Fascists Now Come with ‘A Smiley Face and Maybe a TV Show’. Huffpost, November 14. https://www.huffingtonpost.co.uk/entry/michael-moore-donald-trump_us_5829c5bce4b02d21bbc97cab?guccounter=1.